Radiometric point level detection operates with a radioactive source that emits focussed gamma radiation. 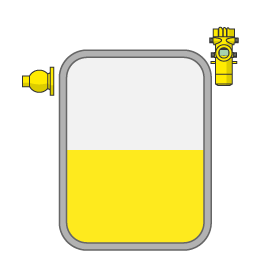 The radiation is picked up by a detector on the opposite side of the vessel. When the gamma rays are blocked by the medium, the detector receives little or no radiation. The intensity changes of the incoming radiation are forwarded as signals by a relay.